Please note: As we prepare for the redevelopment of our Botanic Gardens site, we will be unable to offer our usual programs for school groups at this time. School groups who wish to visit and require only a short introduction from Museum staff (no guided tours) may be accommodated upon request. Please get in touch using this form. Engage, discover and have a blast! 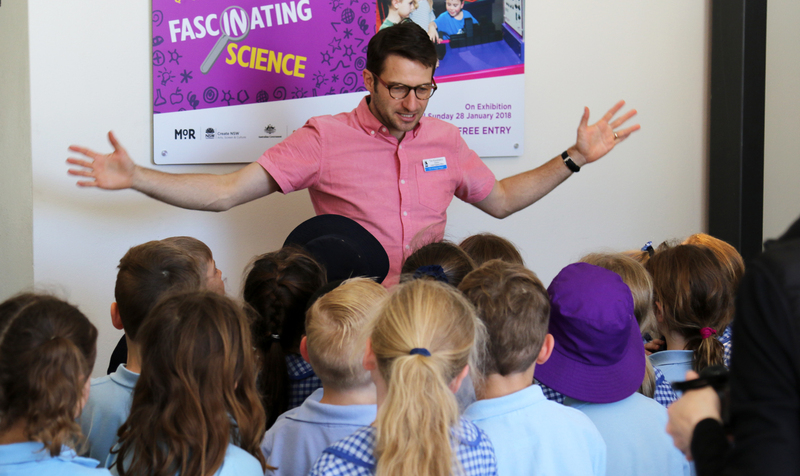 Museum of the Riverina regularly hosts school groups, with programs tailored to a variety of ages and curriculum needs. Have a look a the programs on offer and fill in the enquiry form below to help us understand your needs. The programs listed below are provided to schools at no charge. Discover the history of Wagga Wagga, ‘the place of many crows.’ This tour touches on Wagga Wagga’s Wiradjuri heritage, the early settlers and some of the iconic businesses of Baylis and Fitzmaurice streets. This combination tour/hands-on experience looks at the lives of Wagga’s settlers and farmers. Students can learn a bit about the ingenuity of those who toughed it out on the land, and compare the technologies of yesteryear with the things we take for granted today. Note: People and Place and Past and Present can be run concurrently to accommodate larger groups. Over two centuries the Riverina was transformed into a food bowl as hand tools made way for harvesters! Encounter the machines that increased our capacity to farm, process and transport food to market, including some ingenious local inventions! Fill in our enquiry form to let us know how we can help you. A staff member from Museum of the Riverina will respond to confirm or discuss your booking. Click on the link to download booking information and venue and safety information for visits to each site of the Museum of the Riverina. We have a variety of education resources associated with our permanent collection and travelling exhibitions. From Barbed Wire to Boundary Fences tells the stories of soldier settlers who, after the First and Second World Wars, exchanged the barbed wire of the battlefield for the boundary fences of a soldier settler's block. It is the story of two of the Wagga Wagga Land District's largest estates, Tarcutta and Wantabadgery, and the men, women and children who made their homes there. On exhibition now at the Museum's Botanic Gardens site. Unearth the personal stories of the returned servicemen and their families who began new lives on soldier settlement blocks. Discover how young boys on the post-World War I Tarcutta estate entertained themselves, what living conditions were like, and where the millions of rabbits which overran Wantabadgery in the 1950s ended up! These resources have been created to assist teachers get the most out of their visit to the museum. Including pre-visit, on-site and post-visit activities, students will develop a deep understanding of the living standards and recreation activities on the soldier settlement blocks. The Barbed Wire to Boundary Fences exhibition complements learning about continuity and change, featuring a touch trolley, students will be able to interact with objects that were used in the day-to-day lives of the soldier settlers, their families and their neighbours. Secondary resources provide an engaging array of activities designed to encourage in-depth exploration and substantive conversation among students. These activities utilise primary and secondary sources to enrich learning and invite students to consider the roles and responsibilities of soldiers on the battlefront and those back at home.